I'd originally written an article covering all of the Connecticut minor league teams years ago, when Brushback was an actual print magazine and not just this stupid web log. The article never made it to print, of course, but about a month ago I re-wrote from memory an abridged version of the article that I then posted on a hockey web site (hey, it seemed like a good idea at the time). Nobody read it, of course, which gave me the impetus to put up a finalized version on this site so that nobody would read it here either. One of the main points of visiting a whole bunch of ballparks is to take photos, of course, which I've done. They're all prints, however, and right now I don't have the time or the ability to load them all here. 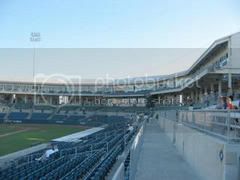 Instead I've used photographs from a number of very good websites: ballparkreviews.com, baseballguide.com, digitalballparks.com, minorleagueballparks.com, and projectbaseball.org. If you're from one of those web sites and you want something in return for using your photos, let me know-- I just bought an awful Girls Against Boys CD and I'm dying to find somebody to get rid of it to. The stadium in the city where I was born, where I saw my first ever minor league baseball game back in 1984. Cory Snyder played for the Waterbury Indians that year, two seasons before he was the Rookie of the Year with Cleveland in '86. The site used to be a horse track, so the stands are on only one side of the field (along the first base line), much like the grandstand is at a race track. 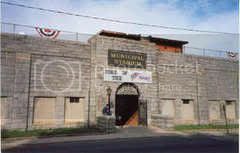 When the Eastern League was in Waterbury (through 1986), the seating was all benches, and the teams barely drew 500 fans per game; individual chairback seats were added for the Spirit in 1997, and a year later a brick concession stand/media booth was built behind the backstop. The Spirit didn't draw very well, either, and only lasted 4 seasons (1997-2000); the stadium sits mostly unused now, save for some amateur tournaments and the like. It was really easy to get foul balls here, because any fouls hit behind the third base side would land on an adjacent high school football field, so you were able to just run over and pick the ball up. I went to 20 games in the Spirit's final season, and got at least one foul ball at every game. Municipal Stadium is always very cold (even in the dog days of summer you'd want to bring a jacket to the game, and the ball never carried well so there'd usually be more triples than home runs), and to describe it as a run-down dump would be extremely generous, but it had a Frankie's Hot Dogs restaurant behind home plate, so the concessions were way better and cheaper than any other minor league stadium in Connecticut. Frankie's is a popular fast food chain in Connecticut, so it was worth it to go to the games just to have supper there. Going to New Britain Stadium gives one an obvious comparison of the upward direction Minor League Baseball facilities have taken in the past decade or so, with a lot of new stadiums being built, mostly because the old ballpark that New Britain Stadium replaced still stands right outside the new stadium: Beehive Field, former home of the Eastern League New Britain Red Sox, and now used almost exclusively by the New Britain High School team, a tiny bandbox of a stadium with mostly old style open bleacher seating (the kind where, if any change fell out of your pocket, it would drop between the floorboards and go right down to the ground). Being a newer building, New Britain Stadium has a lot of extra amenities (skyboxes, a tavern, several picnic areas, a super-wide concourse that you could drive a tractor trailer through, etc), but there's a sterility to the place that leaves it lacking in charm somewhat. What the stadium doesn't lack is smothering heat in the summertime (making it almost impossible to go to a day game in August without sweating off a few pounds) as well as countless minivan loads of oblivious soccer moms and their mostly unattended offspring (NOT the place to go to if you don't like that sort of thing). Rock Cats games have become a hot ticket over the past few seasons, so weekend games are almost always standing-room only, and you'll probably have to walk 10 minutes from whatever hilltop or mountain goat trail they tell you to park your car on (regular weeknight games are still no problem). The only minor league stadium in Ct. that doesn't have free parking (not only isn't it free, they raised it a buck to $3 a couple of seasons ago), plus they lowered all their promotional giveaways to include only the first 1000 or so fans, meaning that you'll almost never get the ball or bat or bobblehead that's being given away. Despite all that, the Rock Cats are my favorite minor league team (figure that one out). One of the oldest stadiums (1927) in the country still being used for professional baseball. Photos of Yale Field pop up every so often as grainy black-and-white backdrops during ESPN documentaries on old ballplayers, masquerading as photos of some century-old park closed decades ago, even though ESPN probably just drove down from Bristol the week before and took the photos. Yale Field has a 25-foot-high manually-operated scoreboard (made from the scrap metal of old WWII battle ships!) in center field that's in play, meaning any home runs to straightaway center have to clear the scoreboard, which I think has only been done twice during a game. Juan "Large Human" Thomas cleared the scoreboard in 2000, when the New Haven Ravens won the Eastern League Championship; I went to every home playoff game that year, and jumped like a delinquent onto the visiting team's bullpen mound when the final out was made. I even got to take part in an on-field contest that season, trying to throw a pitch through a little hole in a piece of plywood. (I didn't win, but at least I hit wood all 3 times, which was better than most people.) The Ravens franchise was moved after 2003, becoming the New Hampshire Fisher Cats, who then promptly won the Eastern League championship last year. So now the New Haven County Cutters of the independent CanAm league (formerly known as the Northeast League) play at Yale Field, to breathtaking indifference... though I did get to see Brian Leetch and some former Rangers and Whalers at a "Hockey Night" Cutters game earlier this season, and got to swipe a bunch of Danbury Trashers pocket folders in the process. Trasher fans can't read or write, so what do they need them for? Not even half of the seats at Yale Field are chairbacks; most are metal benches, and the entire grandstand is covered, which is good when it rains but tends to hold all of the crowd noise in (not that there's any crowds to speak of at Yale Field anymore). When the stands were refurbished for the arrival of the Ravens in '94, the original wooden folding seats were left in place as the top row of each section, which is a nice touch. I love Yale Field-- it's nothing but pure baseball, and it's a great change-of-pace from all the new stadiums in Connecticut, even though the bathroom floors are almost always wet and the place is far from being in the best of shape. New Haven fans are great, though, especially when the Ravens were still around and there'd be a group of fans that would chant "Ba-Ba-Lu!" whenever there'd be two strikes on the batter, while holding up signs of Desi Arnaz. They even made BaBaLu t-shirts, which I bought once, and at a couple of games they taped up a whole bunch of xeroxed pictures of Desi Araz all over the stadium, which was a riot. It's time to do the Babaluuu! Harbor Yard was built on a contaminated plot of land bought from Donald Trump for a dollar, and at first look it doesn't seem like a bad place, with plenty of interesting features like the Amtrak train running behind the outfield fence and the clear view of the shipping docks and the Long Island Sound nearby. I think the stadium is boring, though, with its screened-porch-looking skyboxes (reminiscent of a cheap motel) dominating the look of the ballpark, and too much sterile white paint everywhere. The place looks more like a cruise ship than a baseball stadium, the fans are uninitiated at best, and the concession food is the worst I've ever eaten at a minor league park. After the Bluefish first began play in 1998, for a number of years it was hard to walk up and buy much more than a single ticket on the weekends, but those days are gone now, and even Opening Night this year with John Rocker and the Long Island Ducks in town didn't fill all of the seats. My opinion of Harbor Yard is probably jaded and a bit harsh, though-- I wouldn't steer anyone away from visiting there once (who knows, you might even get mugged walking in from the gravel parking lot someday and have an interesting story to tell people! ), and it's a fairly easy stadium to find, being visible from Interstate 95. 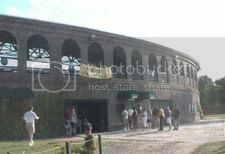 Almost identical in structure with Harbor Yard (both stadiums were designed by the same architectural company-- suprise! ), but much darker in color (no all-white "Love Boat" look here) and much more enjoyable. I like how the concourse runs behind the top row of the stands, rather than beneath the seats, so you can still watch the game over your shoulder while waiting in line at the concessions. The concessions are pretty good, too, with lots of variety. Another nice feature of Dodd Stadium is the grassy berms at both ends of the grandstand, where you can sit on a blanket and watch the game if you like. Norwich fans are fairly loyal and friendly, too, though a bit heavy on the mullet-wearing pig farmer side (I used to live in the area, so I understand). I like Dodd Stadium as a building much more than either Harbor Yard or New Britain Stadium, only that it's in the middle of nowhere, hidden away from any main roads or residential areas inside a desolate, thickly-wooded industrial park, and it's not a convenient drive from most parts of the state. The Navigators also used to be the Yankees affiliate, in what is fairly heavy Red Sox country, but they've been the San Francisco Giants affiliate for a few seasons now, which is neither offensive or inspiring (the Giants haven't developed an everyday position player from their farm system in more than ten years). I got to see Alfonso Soriano and Nick Johnson (among others) fairly frequently while the Navigators were affiliated with the Yankees, though, which was pretty cool. The new owner has announced plans to change the team's nickname to the "Eastern Connecticut something-or-others", in hopes of increasing the team's fan base by making the local towns outside of Norwich feel more included, but that trick never works. 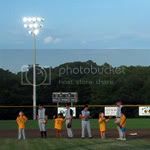 Not really a "minor league" park, but still worthwhile; the New England Collegiate Baseball League is a "wooden bat" summer league for college players, along the same lines as the Cape Cod League (if you're familiar with that). College players from all over the country (even big schools like Texas and Miami) play in these leagues, mostly to get familiar with hitting and fielding a ball that's not off an aluminum bat, and hopefully showing the major league scouts their natural hitting skills that aren't "aluminum enhanced". You can get into Fussenich Park without a ticket, just a two or three dollar donation at the gate as you walk in, and sit wherever you'd like-- either the broken-down wooden bleacher seats on the right, which is where most people sit for some reason, or the more modern chairbacked grandstand behind home plate. It's not a totally backwoods affair-- you can get a program, and there's also jerseys and hats for sale, and a concession stand that has crappy boiled hot dogs for a buck and half or whatever. 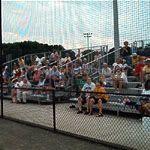 Crowds of 1000 or more are fairly common, and there have been some good players (Dave Parrish, the Yankees 1st round pick in 2000, played for Torrington). Because of the way the ballpark was built into the side of a hill, stadium parking is on a level above and right behind the first base bleachers, making parked cars well within range of any foul balls that go that way. Fortunately, most Twister fans are wise enough to take their ratty old beat-up pickup trucks to the games while leaving their Porsches and Jaguars at home. Like the Twisters, the Manchester Silkworms are one of the three Connecticut teams in the NECBL (Danbury has the other team, but I haven't had a chance to check them out yet). Also like the Twisters, Silkworm games are fairly low-key, family-oriented affairs, with a $3 admission (kids are free), and concession stands manned by volunteers. The concessions aren't bad, either-- for a couple of bucks you can get a pretty decent grilled hot dog, and sodas are a buck. There are two decent-sized bleacher seating areas on both sides of the field, with a PA announcer's booth behind home plate, and there's a merchandise booth where you can get programs, jerseys, hats, and other stuff. Put your earplugs in between innings if you don't like country music, though. The ballpark is part of a larger public park, so there's plenty of space next to the ballfield to play catch or lay in the sun or start your own pick-up baseball game, if that's what you want to do. The big news in Manchester this year was Jonah Bayliss, who became the first ex-Silkworm player to make it to the majors, throwing a scoreless inning in each of his first two outings with the Kansas City Royals in June.